Don’t let your birthday derail your Whole30 success! This Whole30 Compliant Birthday Cake will be loved by everyone! When I began my first #Whole30 back in July, I did not really put it together that my birthday would fall inside those 30 days. I know, I know – part of planning is looking at the entire time frame, but I was so focused on what I could and could not eat – I did not really look to see what other events might be going on during that time. But, because I had committed to myself (and of course all of you) for those 30 days, I knew I could not use the excuse of my birthday to break my commitment. Not to mention it was like Day 22, so I was feeling like a million bucks by then. I had the normal birthday shindig with friends and family here at the house, but everything was Whole30 style… even the #whole30 birthday cake. Begin with one seedless watermelon. Cut of both ends – as straight as possible. 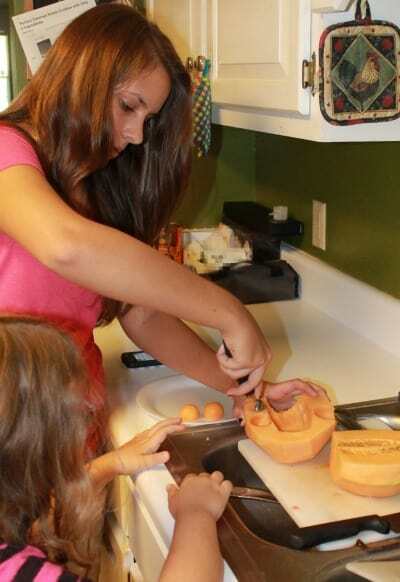 Then, stand on one side, and carefully cut the rind off lengthwise in small pieces, leaving a cylinder shape. This will be the base of your “cake.” Using the fruit baller and cookie cutters, make shapes from firm fruits such as pineapple and cantaloupe. I let the girls help with this part. 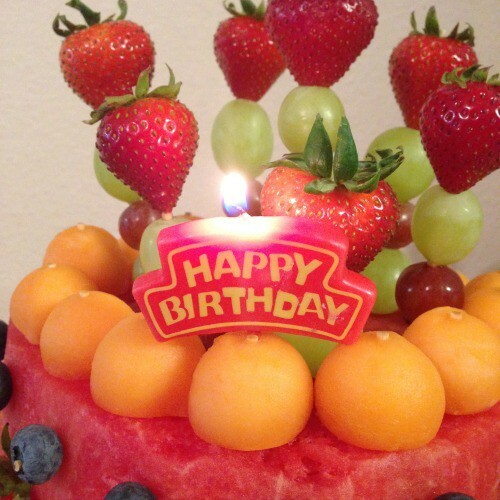 Then begin “decorating” with your fruits using the wooden skewers to secure. 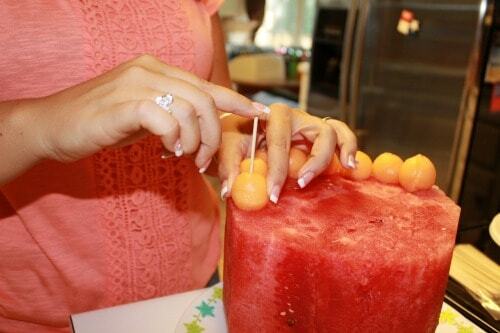 Push the skewers all the way through the decorating “fruit” to secure. If you need to make it shorter, simply cut or break the skewer to your desired length. To be honest, I had no real idea of what design I was going to end up with – I just started sticking stuff places. Eventually I was happy with where everything was. The good news is on this fruit cake – if you do not like the design, you can easily just remove the fruit and start over! Try that on a “real” cake and you have a total disaster. Everyone loved this “cake” and unlike when I have had normal baked birthday cakes in the past – there was not a single piece of fruit left over. In fact everyone there asked if I would make them a fruit cake for their birthday. I think that was the best gift I could have asked for. How cute is that! I love that you were still able to find a fun way to celebrate, without violating the recommendations of the Whole30 plan. Oh my gosh, I love this cake! I am trying to live a healthier lifestyle and have actually looked at the Whole30 plan. So glad you were still able to enjoy a special treat on your birthday! This is SUCH a great idea! And it’s not just great for Whole30. Think about kids with allergies – it would be great for them, too! You did such a good job and good for you for sticking to it! I’ve been dieting during my birthday before and while everyone tells me “oh just eat it” I still don’t. It’s only one birthday, there will be many. Though it sounds like your family may expect this at all your birthdays going forward! This is the cake I want for MY birthday! I’ve not done Whole 30, but I have cut out a lot of things, and just can’t do traditional cake! Wow! What a neat cake! I love it. That is completely special and you can indulge without feeling guilty. You’re so clever! Even if you weren’t doing Whole30 that’d be an amazing cake! I LOVE this! We usually do a fruit bowl but from now on, I’m gonna do a fruit cake! I think this would also be fantastic for a kids party. So fun and festive, but without all the sugary extras of regular cake & icing! Oh..my…goodness… I would probably eat that whole dang thing, it looks so yummy! NOw THAT is a cake I would love to eat! It’s so colorful and pretty – and I know it tastes great! What a wonderful idea! I love this. 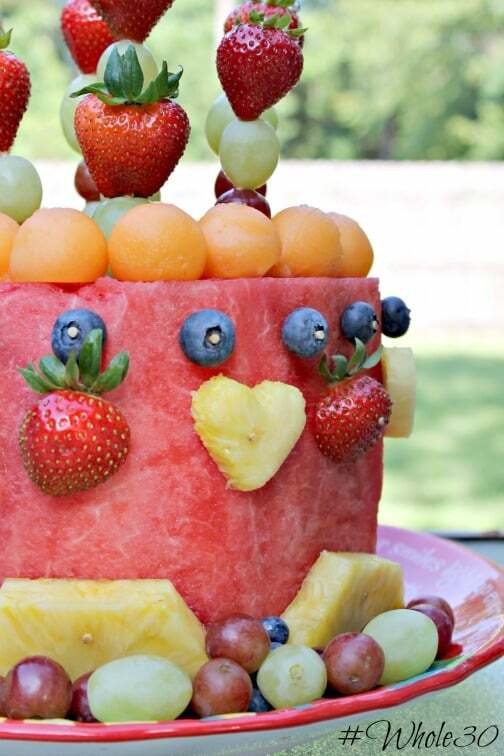 I love fruit and it looks like it would be fun for a kids party because my kids will seriously attack you over some watermelon. Oh my goodness gracious – this is fabulous! I just love how it looks so vibrant and enticing. No element of fun was sacrificed here for health. It looks deelish! This looks awesome my kids would LOVE ATHIS! 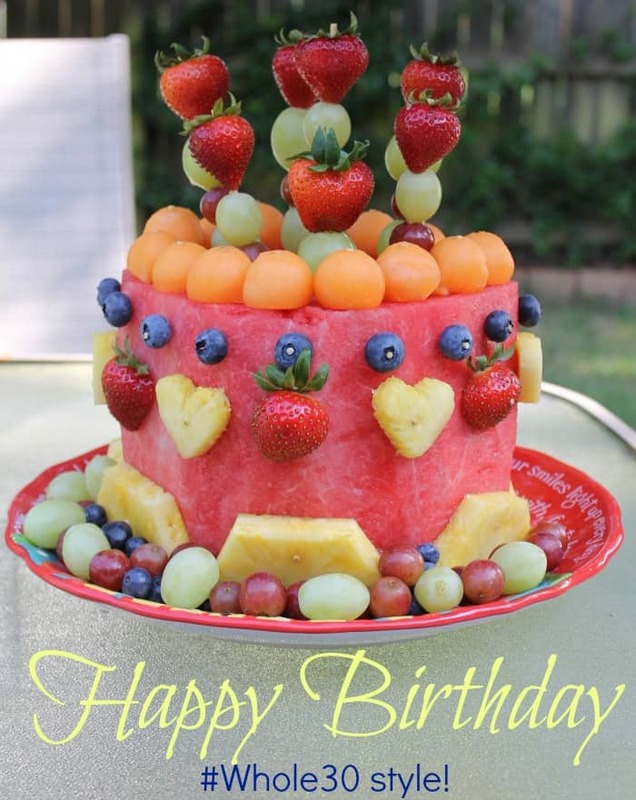 So glad I found this, my daughter is celebrating her birthday tomorrow and she and her husband just started the Whole30 this, so I think this will be a nice surprise for her!! !